If you’re so concerned about the health of New Yorkers, do us a favor and cover your mouth before you talk again. We’re all a little uneasy about swine flu—and for good reason—but your suggestion that straphangers cut up their MetroCards and cower in their apartments is reckless and stupid, damaging to our economy and our psyche. This is the city that never sweats, at least not the small stuff. If Osama bin Laden couldn’t keep us from riding the subway after 9/11, Porky Pig certainly isn’t going to now. You say you don’t like confined spaces, like airplanes. Fine—don’t get on one and come here ever again. But if you do, here’s a MetroCard so you can take the subway or the bus—just like 7 million of us do every day, through good times and bad. Squished up against each other, we may give up our privacy, and even a little bit of our dignity, but we do it with pride and resolve. We’ve done it for 105 years now, through far worse epidemics than this. Yes, the subway we love to hate is a breeding ground for entire civilizations of germs and bacteria. But after riding the Lexington Avenue line during rush hour, our hands are still cleaner than yours are after spending just a single minute in the seedy backrooms of Washington. On Monday, a showboating Air Force One made half the city duck and cover, bringing back memories of our darkest day. But yesterday, Gaffe Force Two (that’d be you, Joe took a shot at our economic backbone. You and the president claim you want to stimulate the economy. But this week, you sent people fleeing from their desks in the middle of the workday and then urged them to stay home for good. You campaigned as a proponent of mass transit. But your remarks could generate mass hysteria. We didn’t ask for your two cents, and our subway turnstiles don’t want your two bucks. As we say in New York: Flu you, Joe. And the pig you rode in on. Awesome! Nothing like a good comeback. It's like brain candy. Yes finally the news reports something true on those idiots !!! (So is Rush Right now or what?!! I hope this swine will reas this !!! Its time to disengage from the union. This White House and Govermant will bankrupt all of us. The are a bunch of morons. ...He (the VP) is no swine for saying what he did. Let's not blow this out of proportion. All he meant to say is that it's best to stay away from crowded, confined places. If the NY Post uses hyperbole, it's fine. That's their job. How else would they boost circulation, or keep it from shrinking. Sensationalism is fine when it comes to selling newspapers, but it has nothing to do with reality!!! Too funny... I was loving reading this until a story popped up on Fox News.... a plane from Germany arrived with at least one person displaying flu-like symptoms....If someone has it on a plane, it is very likely that half the plane was infected. wow! very well said.ny post you did a good job shtuching out the joe biden! Mr. Biden deserves criticism for his remarks, but he is due the respect bestowed upon him by virtue of his office. Wow wow this is something! Usually I agree with the NY Post and I dislike Biden, but this time I think Biden is right. Obviously he knows something that we are not being told if he went and told his family to stay out of planes and trains. Biden is a guy who commuted to Washington from his house in Delaware on Amtrak, so he knows from trains. very well said!! instead of swine flu he has foot in mouth! everytime he opens his mouth he puts his foot in it! do us a favor joe keep ur opinion to urself! Well it's not the first time Biden said a gaffe, and I don't take his comments too seriously. He reminds me of an old uncle, who says whatever comes out of his month. Joe take a nap...okay? 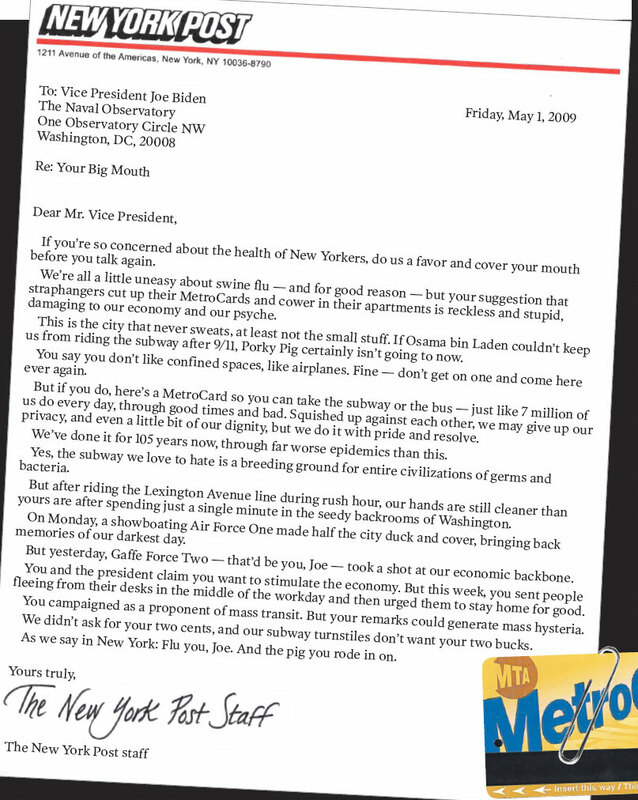 The letter from the NY Post is typical New Yorkersque, but I won't say we take the subway with pride. We're definitely resolve when we have to take the subway or bus, but New Yorkers are also determined because at the end of their destination is a paycheck. “ Too funny... I was loving reading this until a story popped up on Fox News.... a plane from Germany arrived with at least one person displaying flu-like symptoms....If someone has it on a plane, it is very likely that half the plane was infected. That is exactly the reason Biden messed up. Many people cough and many people overreact especially when scared upon. If this would be an issue of health safety then it would be up to the Health Dept. to notify the public not the VP. And if he had a personal opinion for his family, keep it between yourself and your family. Mr. Biden may have frequented the Amtrak, but he's still out of touch and not facing reality. Can you imagine the people strike the subway for one day what an impact it will have on our economy. And if he knows what he says, why not release an official statement, I thought we'll see transparancy. He's a schmuck from day one and now we know how great Former VP Cheney was. However, I certainly hate The New York Abu Graive Waterboarding Times because it is a fading, disintegrating, commie, hate America rag. I am so glad my wife finally cancelled her subscription to that anti American smug vomitous rag! Bye bye NY Times, hello NY POST!! Thank you again you wonderful NY POST. Flu you, Joe. And the pig you rode in on. Wow, you don't have to agree with him but this is just disrespectful. Looks like the telepromter didn't work. You mean to say their not a left leaning newspaper unlike almost all other...I mean which other paper endorsed McCain except a few out of the ordinary ones...That's precisely why I voted McCain, and I don't regret it. I just cannot understand why The president allows him to get any where near a camera or a microphone. puleeez this guy is the amtrak saviour.. boasts about how he takes the train to washington blah blah blah nothing but a hot air baloon on his shoulders. "If someone has it on a plane, it is very likely that half the plane was infected." Thank you for spreading that myth. The most germs will travel in a ventilated plane is a couple of seats. And even then the contagious human to human transfer rate is very low. Chances are a sick person will not infect more than one or two people on a plane, at the most. If that. So get your facts straight before you pull a Biden on us. Well at least he could get a sentence out without all those um um um eh eh eh eh eh er er er er ya know ya know ya know. It's about time someone told off this political version of Ted Baxter (i.e. the character on the old Mary Tyler Moore TV show, like Biden a silver-haired bozo forever putting his foot in his mouth by saying one stupid thing after another). During the campaign, the mainstream news media, clearly enamored of Obama's "historic" candidacy and wanting to be a part of O's New Camelot, gave Biden a free pass on all of his many gaffes (like when he told us that President Franklin Roosevelt went on TV to reassure the public when the stock market crashed in 1929 -- FDR was not yet president then and TV was still an experimental technology the public would not see for at least another 20 years), as well as Obama's own blunders (he told us he had campaigned in "all 57 states," except Alaska and Hawaii!). Meanwhile, they mercilessly ridiculed Biden's opponent, Governor Sarah Palin (a survey among likely Obama voters showed most believed she said she could "see Russia from my house" -- Palin NEVER said that, it was the actress impersonating her in a skit on the Saturday Night Live TV show who said it. Unfortunately, the public bought into the media spin, of Palin = Stupid vs Biden = wise and experienced -- when this buffoon has been on the WRONG side of virtually evey important issue since he got to Washington in the1970s. The office of Vice President normally would deserve respect -- but not if the man occupying it is an idiot. You all got to agree that Obama has deep regrets about taking Biden as his v.p. - this guy is such a liability for Obama - its no secret that their closeness has somewhat deminished. "Flu you, Joe. And the pig you rode in on"
shows the real new york & Proud of it. It's not often that laugh out loud reading VIN. What a letter. Biden was actual a brainstorm for Obama. Think how many people are now praying for his weill being. If anything happens to Obama, you know who we get for president.